This story was updated at 1:33 p.m. ET. The morning skies over Europe, the Mideast and elsewhere dimmed in an unnatural twilight early Tuesday when the moon blocked part of the sun in the first partial solar eclipse of the year. 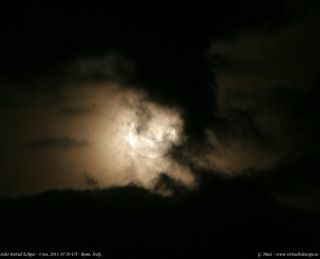 Clouds lend an eerie quality to the partial solar eclipse of Jan. 4, 2011 in this photo by astronomer Gianluca Masi of Italy, who observed the event from Rome. "It was a memorable experience and I feel lucky to [have seen] it," astronomer Gianluca Masi of Italy, who observed the event as part of the Virtual Telescope Project. Masi watched the partial solar eclipse from Rome, where the sun was just under two-thirds - about 61 percent - obscured by the moon. In Sweden, where the eclipse was at its maximum, the moon blocked out about 80 percent of the sun's disk. Skywatcher Dennis Put of Maasvlakte in The Netherlands snapped stunning photos of the solar eclipse at sunrise, despite a disheartening weather forecast. Skywatcher Dennis Put of Maasvlakte in The Netherlands took this amazing sunrise solar eclipse photo on Jan. 4, 2011 during the first partial solar eclipse of the year. There were still some clouds that in the sky over the Netherlands, but Put said they didn't intrude too much. In all, Put took 675 photos of the partial solar eclipse. "A successful eclipse!" he exclaimed. Likewise, Masi said the eclipse still dazzled, despite a cloudy sky above Rome. "The clouds added some special flavor the images," Masi told SPACE.com in an e-mail. Masi said the sun was low on Rome's southeastern horizon during the eclipse. Tuesday's partial solar eclipse began over Algeria. According to Sky & Telescope Magazine, millions of skywatchers across Europe and parts of Africa, the Middle East and Asia were expected to get a chance to observe the eclipse, weather permitting. "Europeans won't get another opportunity to see the sun covered to this extent until March 20, 2015," reported Sky & Telescope before the event. Solar eclipses occur when the moon passes between the sun and the Earth and appears to line up with the sun when observed from the ground. When the sun and moon line up perfectly, a total solar eclipse occurs and completely covers the sun. Sometimes, however, the moon only covers a portion of the sun, creating a partial solar eclipse like the one seen today. Skywatcher and photographer Dennis Put caught this amazing view of an aircraft flying across the face of the sun during the partial solar eclipse of Jan. 4, 2011. This photo was taken from Maasvlakte in The Netherlands. "I was impressed to see many casual observers trying to look at the sun," Masi said. "People were quite informed, I must say: Eclipses are among the things happening up there they like more." Tuesday's partial solar eclipse occurred just after the peak of the Quadrantid meteor shower, which hit its height at 0100 GMT in Europe today. The eclipse was the first of four partial solar eclipses set for 2011, though there will not be a total solar eclipse this year as there was in 2010. The next partial solar eclipse will occur on June 1, according to NASA's eclipse tracking website.